The island has certainly changed since those tranquil days. In the 1870s the people of Sydney had the view that the Russians were likely to invade Australia. Therefore, in 1877 two British fortification experts, Sir Peter Scratchley and William Jervois were sent to Australia as a result of a request from the Colony of New South Wales. They were given the task of designing and co-ordinating the defence of Sydney and they planned a series of forts and gun batteries to protect against attack. Bare Island was planned as the sole defence of Botany Bay. The fortifications on the island were built during the period 1881 to 1889 under the direction of the Colonial Architect, James Barnet. The barracks were completed in 1891. It became apparent that the fort and barracks had been subject to substandard workmanship and this led not only to the resignation of James Barnet, it led to a Board of Inquiry and then to Australia's first Royal Commission. Joined to the mainland by a small timber bridge, Bare Island is perfect for either day or night diving in almost all weather. In even moderate seas you can safely dive in almost any spot and in very heavy seas you can usually dive the protected side of the island. A number of different dives can be done around the island itself, as well as along the shore on either side of the bridge. Also see Bare Island Left, Bare Island Right, Bare Island Deep and Bare Island Bombora. This dive is a circumnavigation of Bare Island. However, unless you are confident that you can last over an hour on your tank, do not attempt this dive. Also, you should only do this dive on an incoming tide as there can sometimes be a very strong current behind the island on an ebb tide. I suggest using a larger tank as even I cannot make it around on a 62 cubic foot tank (except as I will describe later). You can do in reverse on an outgoing tide. After gearing up, enter the water at the same spot as Bare Island Left. Start under the bridge and head to the east, circling the island in a clockwise direction. Follow the same route as the Bare Island Left dive until you come to the open flat area indicated on the accompanying diagram. From here, keep as close as possible to the wall and you will come to a point below the back left corner of the island's rock platform. The depth here is six metres. If it is really calm you can cut between the island and the large rock. Alternatively, swim to the left of the rock. Continue in a south westerly direction until the depth is about 9 to 10 metres. Turn to the west and maintain a similar depth until you reach some low step-like rocks in a rough north-west/south-east alignment. You may come up a little to six metres to go over a "hill" but you will then drop to 14 metres and further on, deeper. It will be about nine minutes from the south-east corner of the island. Turn right and follow the sand edge to the north-west or north. You can get to 18 to 19 metres on a high tide. As you follow this wall you will find many overhangs, cracks and even a small cave. There are sea dragons along this section of the dive, so keep your eyes open. As you go, keep an eye out for a medium size Admiralty anchor which is separated by a few metres from the main wall. Use this as a reference point. You can go past this anchor for another 25 metres before leaving the wall. Note that there are some pygmy pipe horses in this area, see Bare Island Deep Wall page. The wall eventually peters out and you need to turn right. As mentioned, you can turn anywhere along here but I would go a bit past the anchor. You will come up to about 16 metres and you will find another small wall (on later dives you can follow the sand for a few more minutes but first time, turn right at the anchor). This will be about 12 minutes from where you met the sand edge. Follow this small wall to the left (north-west) and it also ends. Turn right again and you will cross some sand and find another wall which you also follow to the left. You will soon come to a prominent corner where there is a cave. This is about 13 to 14 metres. Turn right here and head back to the east, following the very prominent wall. After about 15 minutes the reef turns hard right and the depth is 5 to 6 metres. Instead of following the reef, cross the sand and head north-east and this will eventually bring you back to the bridge. Go under the bridge and exit where you entered the water. It should take you about 70 to 80 minutes to travel completely around the island, including plenty of time for examining sites. If you do not think that you can make your air supply last that long, keep closer in to the rock platform on the southern side of the island. This should take you about an hour. Maximum depth is approximately 19 metres. A very good dive that is a bit different but only for the experienced. In March 2001 a friend and I used my two scooters to do this dive. We even went right out to the Bombora before turning to the west and hitting the sand edge again. It took us 57 minutes and I used less than 150 bar of a 62 cubic foot tank. A great dive, during which we saw 25 to 35 sea dragons (I saw 25 and my buddy reckons he saw 10 I did not see), huge schools of bream, sweep, luderick and ladder-finned pomfrets as well as a few big kingfish. In August 2002 I did it again using a scooter, this time in reverse. A great dive. On 2 January 2004 I and a friend did the above dive without scooters, a fantastic dive! 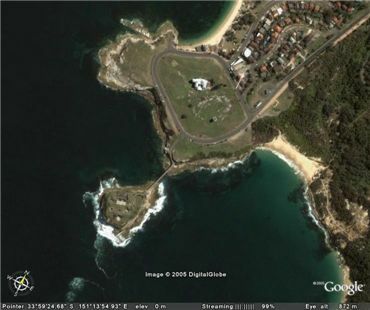 An alternative is to start at the back south-eastern corner of Bare Island and do a 3/4 circumnavigation. See the separate page on that dive.